This seems like such a simple thing. Most of us do this as a matter of course whenever we dry a load of laundry in our dryer. Forgetting to do it, however, adds up to a significant cost. Not only does it make your dryer run less efficiently (depending on the level of lint and your specific type of dryer, it can reduce the efficiency by 75%), it also forces your dryer to work harder and can contribute to a shorter lifespan for your dryer. As Brittany’s photograph clearly illustrates, one key step to making sure that your dryer is free of lint is cleaning out your lint trap. Whenever you’re about to run a load of clothes, simply remove the lint from the lint trap with your fingers and toss it in the trash. However, that’s just one step in the process. There are additional steps you can take which will maximize the airflow into and out of your dryer, making it run more efficiently. A more efficient dryer is a dryer that costs less to run per load and has a longer lifespan, saving you money both now and later. First, make sure the external opening for your dryer vent is clear. If you don’t know where your dryer vent is, spend some time tracing the vent that goes out of the back of your dryer. One method is to simply inspect the outside of your house, particularly on a very cold day, when the dryer is running. At my home, if the temperature is below freezing, there is obvious steam coming out of the dryer vent. Cleaning it is easy. Just lift up whatever is guarding the trap and remove any lint or debris that is filling the exit. Ours tends to fill with debris about every six months or so and it makes our dryer run much less efficiently. Next, once a year or so, clean out your dryer vent completely. This is a straightforward process, but it does take a bit of time and requires you to move your dryer. eHow has a great step-by-step guide for the process. Many people tend to do this only when they install (or have someone install) a new dryer – and they’re often shocked as to the incredible level of lint and other materials that have built up in the vent. Quite often, that material has caused the person’s dryer to work much harder than it otherwise would have, bringing on a dryer replacement much sooner than would otherwise have been needed and also using more energy per load, adding to the usage cost of the dryer. A final tip: occasionally wash your lint filter. That’s right, pull out that lint filter wash it with soap and water. Why does that make a difference? 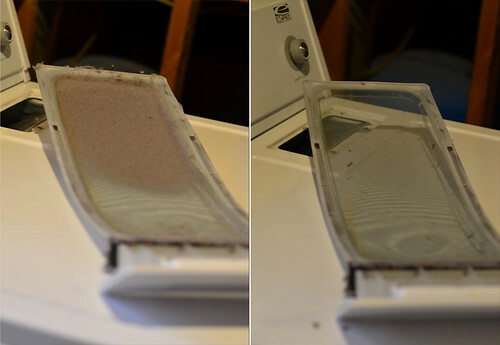 As Snopes explains it, “[j]ust removing the lint from the lint filter isn’t always enough – the fine mesh of most dryer filters can be clogged in ways that aren’t obvious at a casual glance.” A quick scrube and rinse in warm soapy water will do the trick. We try to wash our lint filter once every three months or so. Honestly, we’d probably do it more often if the lint filter wasn’t on the other end of the house from our primary sink for washing dishes. What will all of this accomplish? For one, it will make your dryer run efficiently. While it’s hard to find exact data on this, simple observation bears this to be true. If our vents are clogged, it can take twice as long or longer to dry a load of clothes. More efficiency when the dryer is running means more savings for you. For another, it will extend the life of your dryer. The heating element will receive less stress, as will the fan. The less stress you put on these key components, the longer they will last. Simply removing lint from your dryer’s exhaust system is a double win. You save now by using less electricity per load, reducing your electric bill, and you save later by not having to replace your dryer as often.